Dentures are replacements for missing teeth that can be taken out and put back into your mouth. While they take some getting used to, and will never feel exactly the same as one’s natural teeth, today’s dentures are natural looking and more comfortable than ever. There are two main types of dentures: full and partial. Your dentist will help you choose the type that’s best for you based on whether some or all of your teeth are going to be replaced and the cost involved. With full dentures, a flesh-colored acrylic base fits over your gums. The base of the upper denture covers the palate (the roof of your mouth), while that of the lower denture is shaped like a horseshoe to accommodate your tongue. These are custom-made in a dental laboratory from impressions taken of your mouth. Your dentist will determine which of the three types of dentures described below is best for you. Over a period of time, your denture will need to be relined, remade, or rebased due to normal wear. Rebasing means making a new base while keeping the existing denture teeth. Also, as you age, your mouth naturally changes. These changes cause your denture to loosen, making chewing difficult and irritating your gums. At a minimum, you should see your dentist annually for a checkup. • When handling your denture, stand over a folded towel or basin of water. Dentures are delicate and may break if dropped. • Don’t let your dentures dry out. 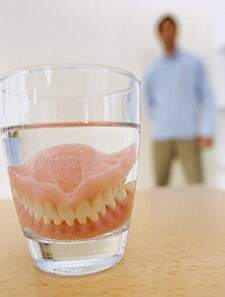 Place them in a denture cleanser soaking solution or in plain water when you’re not wearing them. Never use hot water, which can cause them to warp. • Brushing your dentures daily will remove food deposits and plaque, and help prevent them from becoming stained. An ultrasonic cleaner may be used to care for your denture, but it does not replace a thorough daily brushing. Also do not used toothpaste on your dentures because it is too abrasive. Simple soap and water will do fine. Brush your gums, tongue and palate every morning with a soft-bristled brush before you insert your dentures. This stimulates circulation in your tissues and helps remove plaque. • See your dentist if your dentures break, chip, crack or become loose. Don’t be tempted to adjust them yourself as this can damage them beyond repair. The process of getting dentures requires several appointments. At the first appointment, impressions and measurements are taken and used to create your custom denture. Follow-up appointments may be necessary to ensure proper fit. At the final appointment, your dentist will adjust and place the completed denture. Keep in mind that just like your teeth, dentures should be cared for with the same diligence. This means daily brushing and regular visits to your dentist.